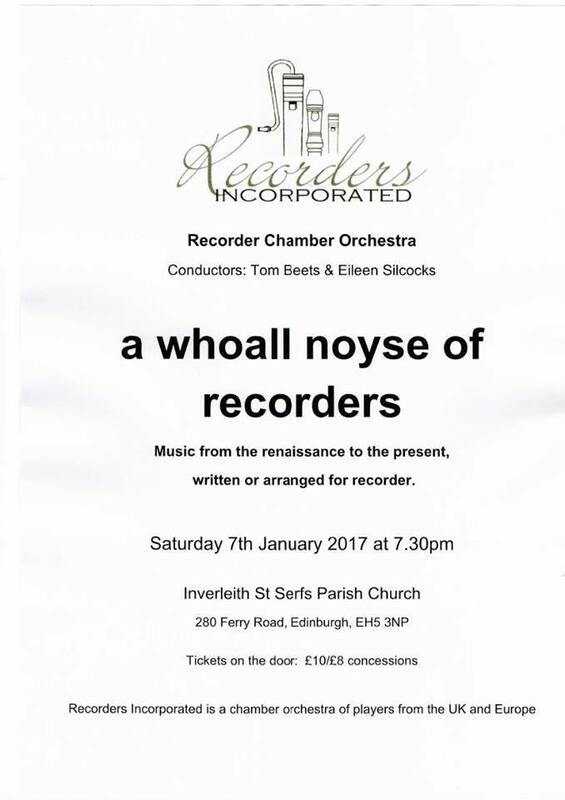 As usual, the first event of my musical year will be a performance by the recorder chamber orchestra, Recorders Incorporated. I have been a member of the group since it was formed in 2007, and this, on 7th January, will be our tenth concert. The group usually numbers about 18-20 recorder players from across Europe. Each year we meet up in early January for a period of intensive rehearsal, leading to a concert. We have performed at venues across the UK and this year sees our first visit to Edinburgh. A Recorder Orchestra is Born! East Midlands Recorder Orchestra was ‘born’ on Sunday 18th September 2016. On that day, 24 recorder players travelled from across the region (sometimes for several hours!) to Balderton (just outside Newark on Trent) in order to attend the birth – following a gestation period of about 10 years! It could be said that the birth was ‘induced’ by my friend Nick Wynne who, following a casual conversation one lunchtime, emailed me the following day to say that he had found us a venue and was set to email recorder players in the area… After that, the enquiries quickly arrived. On the day, the sun was shining. The 24 players, many of whom had never played in a recorder orchestra, set down with good humour and proceeded to tackle the music in front of them. During the course of the afternoon we played music by Holst, Saint-Saens, Grieg and Jenkins with very encouraging results. Following the successful birth, the prospects for a happy childhood look rosy indeed – fingers crossed that EMRO goes on to lead a long and prosperous life!